Drop Dead Easy Knits ~ Quince & Co. Owl Giveaway! Last week a new and exciting knitting book was released, Drop Dead Easy Knits, by Gale Zucker, Mary Lou Eagen and Kirsten Kapur. I am fortunate enough to have a pattern included in the book, Bear in a Bunny Suit. I have a little story on how this came to be. A couple of years ago Gale Zucker, who I first met at the SSK retreat in Nashville, asked if I wanted to get together at Vogue Knitting Live in NYC. I said sure! I love Gale and so does everyone else; she's a good soul. Well, to that meet-up Gale brought along Kirsten Kapur, who I didn't know personally but of course I know and love her knitting. We chatted for a bit at the hotel and then they took me on an adventure weaving through the city to a pop-up yarn shop for Starcroft yarn and fiber (this is amazing yarn with an even better story behind it). I had the best time ever. I just loved that night, it was warm and cozy and magical. The beautiful sheep-y wool fumes and the knitting talent in that tiny shop was overwhelming. I stayed an hour or two. Right before I left to go back to the hotel Kay Gardiner of Mason-Dixon Knitting walked in the shop and I briefly got to meet her which was great. Gale Zucker is the common thread here for me and possibly everyone else at that event. Gale likes to bring people together. She is kind and friendly and interested in others. When I was at SSK she arranged a dinner with Ann Shayne, the other half of Mason-Dixon Knitting, and that was another treasured memory I have due to Gale. Really my dream is to get to work with Gale someday on some sort of project and hopefully that will happen. Kirsten Kapur, who is a native New Yorker, helped me catch a cab to get me back to the hotel. While we walked a block or two to get to a good cab-catching spot Kirsten asked me if I would design something for their new book. Gale and Kirsten were going to ask me earlier in the night but the night sort of swept away quickly on us. I said yes to the book project offer, Kirsten flagged down a cab for me and I jumped in. That was that. A short while later they got in touch with more details about the book and I started dreaming up my project for the now named book, Drop Dead Easy Knits. The projects are supposed to be fairly easy and doable, that is the point. I like that in any project and those are usually the most inviting projects to me so it's a good fit. 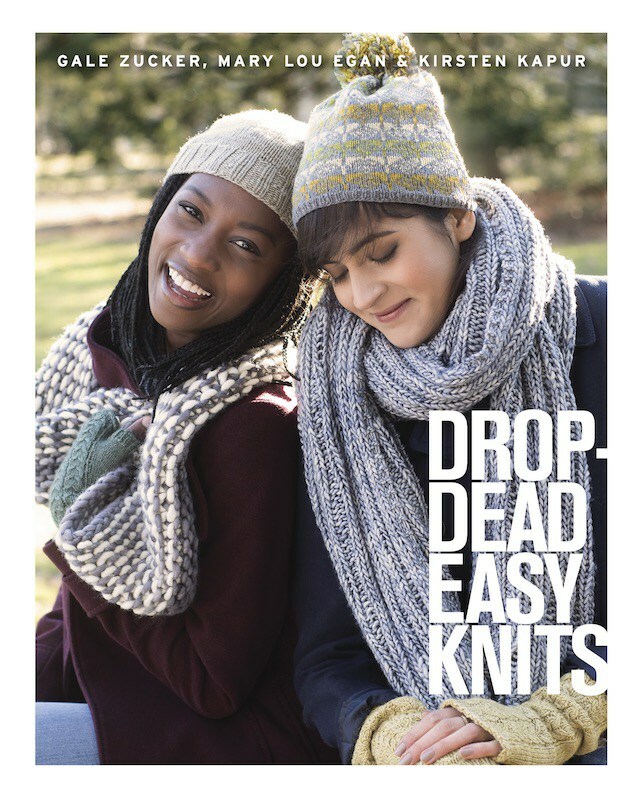 Click here for Drop Dead Easy Knits on Amazon! Click here to see all of the projects in the book on Ravelry! There are patterns for sweaters, blankets, shawls, mitts, cowls, a scarf, and hats to name a few. It has great variety. 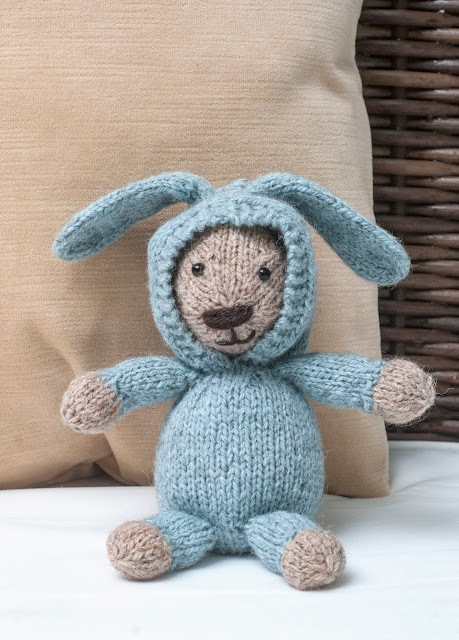 For my project I had always wanted to knit a little bear in a bunny suit and I thought Drop Dead Easy Knits might be a good place for it. 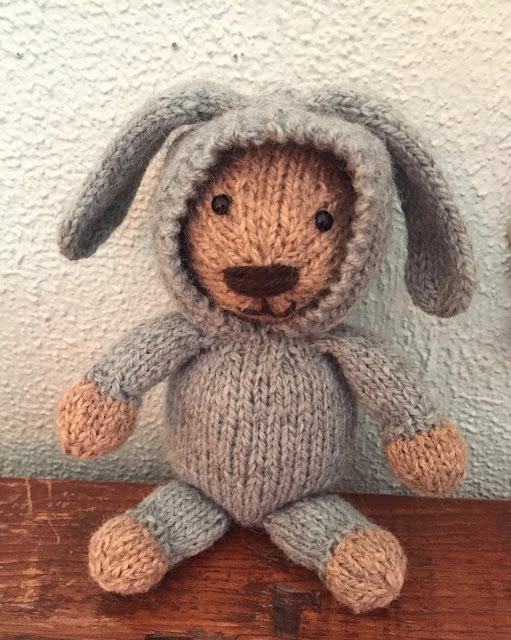 My youngest daughter had a little stuffed bear dressed in a pink bunny suit when she was little and I saved it thinking I'd love to knit one of my own someday. I finally had the chance. I was excited to dig in and create this new and fun knit toy. 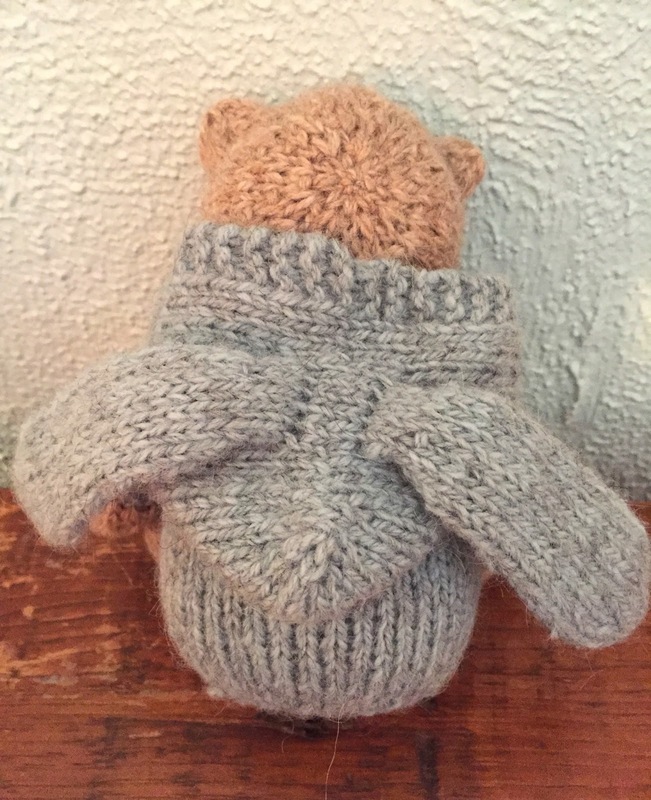 Click here for the Bear in a Bunny Suit project page on Ravelry! 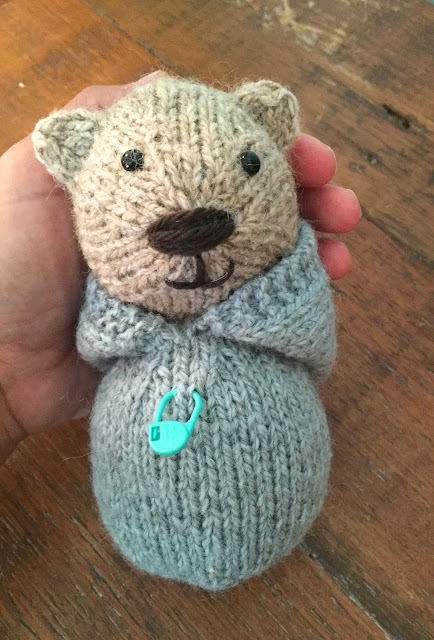 I picked Owl yarn by Quince & Co. as the yarn for my bear. Two skeins of Owl is all you need and you could easily get two bears out of the two skeins. 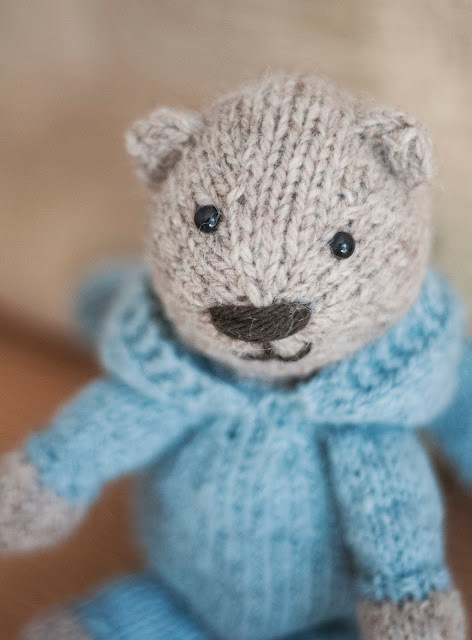 The bear is a fast knit on a worsted weight yarn on US size 5 needles. The hood can be taken off or can be pulled up. I love a toy that has something to do and the hood with ears provides the "to-do" in this toy. The toy is constructed almost completely seamlessly from the bottom up. The only stitching together is for attaching the head to the body which only takes a minute. With easy increasing and decreasing the bear body and head come together quickly. The hood, ears on the bear and hood, arms and legs are all picked up and knit directly onto the toy so there are no separate parts to stitch together. I used safety eyes but you could easily embroider eyes as well. The Quince & Co. Owl is such a great yarn for toy knitting. The alpaca halo and heather-y look of the yarn gives the toy a cozy, old-fashioned look, sort of warm and comforting. Anyway, it's a cute and quick knit. Bear in a Bunny Suit is the perfect project for the gift-knitting season that is now upon us. Click here to see more information about the Bear in a Bunny Suit! There are so many projects in Drop Dead Knits that I would like to knit myself and I think you'll feel the same way, too. As a matter of fact I just looked up the book on Amazon and it is already the #1 bestselling knitting book! Congratulations to Gale, Mary and Kirsten! That's so exciting. I am giving away one copy of the book today. I also contacted Quince & Co. to see if they would want to give away two skeins of Owl to knit the Bear in a Bunny Suit and they said yes! So the winner of the giveaway will get to choose two skeins of Owl in any of the available colors along with winning a copy of Drop Dead Easy Knits. To enter to win please leave one comment on this blog post that includes your Ravelry username or an email address so I can contact you if you win. Please be patient for your comment to appear and only click on the Publish button one time. There is a delay before you will see your comment.